The design of the V-Lux allows the camera to be sturdy but also not too light, by combining the DSLR-style design with a fixed lens you can combine better quality images but still maintain a lower cost. While certain design features remind you that it is indeed a Leica camera, such as the metal stamped logo and small metal accents on some of the buttons, you'd be hard pressed to differentiate this camera from many others on the market. This is where Leica has also taken a note out of someone else's book - the entire camera is based on a Panasonic chassis and User-interface. What this results in is some very basic on-screen animations and what feels like a Panasonic-based camera that has been mildly altered with the on-screen functionality made slightly more complex. The key reason for shelling out on a Leica is the image quality, and in this department the V-Lux 3 does not disappoint in the slightest. Boasting a colossal 24x super-telephoto lens, this camera is capable of seeing things that most compacts can only dream of. The good news doesn't end there - the image quality from the 12.1-megapixel sensor is superb, with the autofocus performing incredibly well under very tough conditions. While continuous shooting boasts 12 frames per second which, when used carefully, works very well indeed. The Full-HD 1080p video-recording is incredibly crisp and the addition of stereo mics helps make this a genuinely useful tool for recording video. That said, it's not something you can just whip out and use. The V-Lux 3 is a complete conundrum of a product, on the one hand its cheapish design and feel makes it feel like a souped up Panasonic equivalent while on the other, the images it takes are so good you may not care. Arguably this then is a decision that falls on the consumer as an individual rather than there being a clear solution. 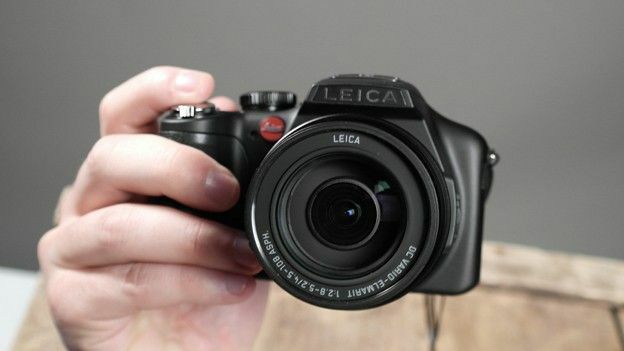 At £690 this may well be outside many price ranges, and while it does boast Leica's proven image expertise, it is difficult to decide whether this is worth nearly £700. Stay tuned for a full review.